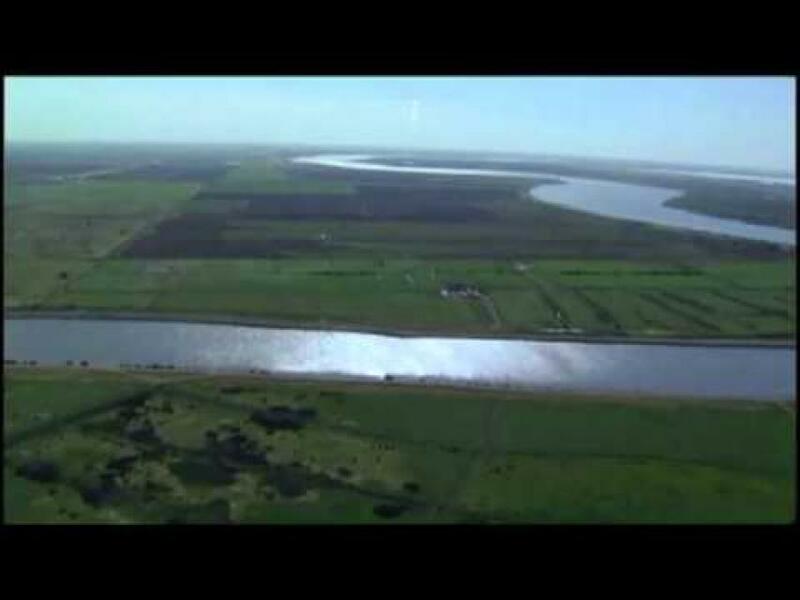 The Sacramento-San Joaquin Delta is California’s most crucial water and ecological resource. More than a century ago, farmers began building a network of levees to drain and “reclaim” what was then a marsh. Progressively higher levees were built to keep the surrounding waters out, the lands were pumped dry and the marsh was transformed into productive island farms, mostly below sea level. [See Sacramento-San Joaquin Delta Timeline]. The Delta is formed by the Sacramento River flowing south to meet the north-flowing San Joaquin River just south of Sacramento, where the rivers mingle with smaller tributaries and tidal flows. The rivers’ combined fresh water flows roll through the Carquinez Strait, a narrow break in the Coast Range, and into San Francisco Bay’s northern arm, forming the Bay Delta. Suisun Marsh and adjoining bays are the brackish transition between fresh and salt water. But the location of that transition is not fixed. Today, 1,100 miles of Delta levees protect farms, cities, schools and people from flooding and related hazards. For example, the fragile levees are vulnerable to earthquakes and other seismic activities. Roughly one-third of Delta water is delivered to the San Francisco Bay Area, while slightly less is diverted to Southern California. Fed by runoff from the northern Sierra Nevada and southern Cascades mountain ranges, the Delta is a 700-mile maze of sloughs and waterways surrounding more than 60 leveed tracts and islands. The Delta is the hub of California’s two largest surface water delivery projects, the State Water Project and the federal Central Valley Project. The Delta provides a portion of the drinking water for 25 million Californians and provides the $36 billion agricultural industry with irrigation to 4.5 million acres. More than half-a-million people call the Bay Delta home, living in 14 cities and towns in five counties. Five highways pass through the Delta, as do three railroads, two deep-water shipping channels, hundreds of natural gas lines and five high-voltage transmission lines. The Delta also is home to an important estuary, a coastal area where fresh water from rivers mixes with ocean water and where salinity (saltiness) is between the extremes of seawater and fresh water.The Delta also provides water to millions of acres of cropland. The Delta estuary is the largest on the west coast of North America, covering more than 40 percent of California – more than 738,000 acres in five counties. An estimated 25 percent of all warm water and anadromous sport fishing species; 80 percent of the state’s commercial fishery species live in or migrate through the Delta, and at least half of its Pacific Flyway migratory water birds rely on the region’s wetlands. For more than 30 years, the Delta has been embroiled in continuing legal controversy over the struggle to restore the faltering ecosystem while maintaining its role as the hub of the state’s water supply. Scientists attribute the low numbers of Delta fish species, such as the endangered Delta smelt, to human activities, drought and pumping operations. This issue has been at the center of numerous lawsuits and counter lawsuits from a range of stakeholders such as conservation group and agricultural interests [see also Delta Litigation]. In 2013, California Gov. Jerry Brown proposed constructing two tunnels to divert Sacramento River water underneath the Delta. As part of an updated Bay Delta Conservation Plan (BDCP), it would have included three intake pipes in Sacramento County near Clarksburg. Modern fish screens would also be in place to better protect fish from being sucked into the pipes. The diverted water would be sent to farmland and communities elsewhere in the state. The BDCP was re-branded as the $15 billion California Water Fix/EcoRestore when it was determined that the regulatory agencies could not provide the 50-year assurance of protecting the imperiled species sought by the water agencies. EcoRestore seeks to create or restore 30,000 acres of Delta and Suisun Marsh habitat – including aquatic, sub-tidal, tidal, riparian, floodplain and uplands. Most of the work is already required because of existing biological opinions and will be funded by CVP and SWP contractors. The rest, about 25 percent, is covered by bond and other funds through state agencies. Costs for EcoRestore are expected to reach at least $300 million in the first four years.